Mr. Duplin was the US Sailing Yachtsman of the Year in 1963. When Joseph R. Duplin returned to Winthrop from Chicago after winning the International Star Class sailing championships in 1963, he brought home a trophy so large that the Associated Press shot a photo of his 11-month-old daughter Carolyn sitting inside it. He celebrated at a gathering in the Cottage Park Yacht Club in his hometown of Winthrop, where the skipper’s boat, Star of the Sea, was docked. 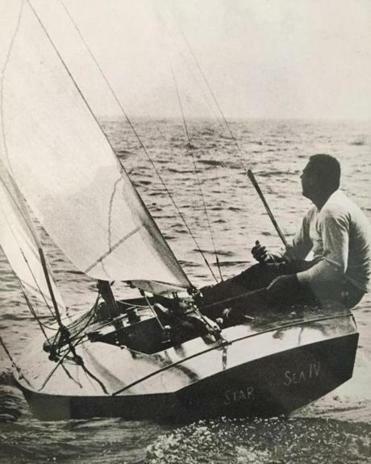 Mr. Duplin, who was named the US Sailing Yachtsman of the Year in 1963 and is enshrined in the National Sailing Hall of Fame in Annapolis, Md., died of complications from Alzheimer’s disease Aug. 7 in his Winthrop home. He was 82. A successful college coach who formerly owned Duplin Marine in Winthrop, Mr. Duplin was also a member of the Inter-collegiate Sailing Association Hall of Fame at the US Naval Academy. From 1967-1980, he coached 10 All-American sailors at Tufts University while producing seven national championship teams. His sailors won a combined 17 All-America awards. Commette said his mentor was well-known for “Duplinisms” — blunt one-liners that got to the heart of the task at hand. They included phrases such as “come on, babe, I want to see blood in the bilges” and “it’s not rocket science, babe, keep pointing the boat at the mark.” Decades later, the men and women Mr. Duplin coached could still recall those expressions. At Tufts, the Duplin Trophy for the spring women’s sailing regatta and the carpentry shop at the Bacow Sailing Pavilion are named for Mr. Duplin. He also was on the coaching staff of the 1972 and 1984 US Olympic sailing teams, and formerly coached at the Massachusetts Institute of Technology, the University of Massachusetts Boston, what is now Salem State University, and the Massachusetts Maritime Academy. Mr. Duplin’s accomplishments include the New England Star Class and European Star Class championships, and winning the Etchells 22 North American competition. That drive and competitive urge rubbed off on current MIT sailing master Fran Charles, whom Mr. Duplin coached at Tufts. “I never lost that passion for sailing instilled in me by Joe. He was my inspiration,” said Charles, a former US national sailing team member. Mr. Duplin, a Navy veteran and former assistant sailing instructor at the Naval Academy, inherited his athleticism and desire from his parents. His father, Ralph, a Stoneham High and Georgetown University Athletic Hall of Famer, formerly was principal at Winthrop High. He also was head counselor at Camp Idlewild on Lake Winnipesaukee, where his son learned to sail. “It was a Cape Cod Knockabout and it seemed too tame to me,” Mr. Duplin, a 1953 Winthrop High graduate, told the Globe in 1994. His mother, the former Loretta Bourque, later bought him a Star Class boat. At age 16, he won his first Star Class race against more experienced skippers. “The story is that my grandmother told my father, ‘I didn’t get you that boat to finish second,’ ” said Mr. Duplin’s son Joseph Jr. of Winthrop. Steve Winkler, who worked at Duplin Marine and bought the business from Mr. Duplin, said it was fascinating to talk with him for hours about sailing. Mr. Duplin’s first marriage, to Maureen Gilligan, ended in divorce. He married Elizabeth Rowlinson in 1983. A service has been held for Mr. Duplin, who in addition to his wife, his son Joseph Jr., and his former wife leaves three other sons, Timothy of West Boylston, Andrew of San Francisco, and Matthew of Winthrop; three daughters, Carolyn Milordi of Lynnfield, Angela Hickey of Winthrop, and Maureen Mirabile of Beloit, Wis.; and 12 grandchildren. Mr. Duplin “was most happy when he was in the presence of the ones he loved,” Joseph Jr. said in a eulogy. Andrew Menkart, a former North American Star champion who attended Tufts, drove there from Vermont.